Makati’s Carlo Mojica said that despite needing the use of crutches, he loves to travel. He was unable to walk since he was a child but the moment he learned to use crutches, he had loved to go out. 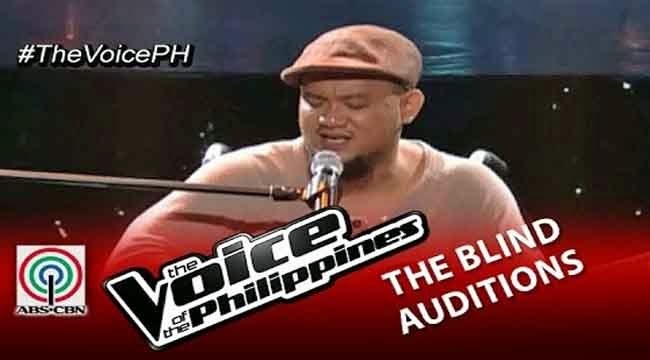 He had joined The Voice to prove that his disability will not be a hindrance for him to reach his dream. Bulg, Pipi, Bingi seemed to be a perfect selection for his entry. Lea swayed at the song as the rest of the coaches listened intentionally. Apl De Ap and Bamboo turned and seemed to be amazed as they see the artist sitting in a wheelchair. Bamboo asked for his intentions and he answered the he is dedicating his song for all the PWD’s. Apl De Ap said that he is also legally blind and he can feel that Karlo has the same advocate with him. Bamboo thought that he was the only one who had turned. He said that he got caught up with the song and the voice. Karlo picked Bamboo and the coach admitted that he did not expect that he will be chosen. Karlo explained to Toni that he had first considered Apl De Ap but he also wanted a coach that is up with bands and Bamboo was the perfect one for him.